Ready or not, the holiday season has begun. Christmas music is already playing in the stores and on the radio, decorations can be seen on lampposts, store windows, and yes, even on homes, and the marketing ads have hit TV and magazines. I try to be proactive when it comes to holidays. I attempt to get my shopping done before Thanksgiving because I prefer to enjoy the season with family and friends sharing a nice meal and a glass of wine. I decided to host a Holiday Open House that would showcase great wines that could be beautifully paired with traditional holiday fare…what fun! While my guests sampled a variety of international cheeses and some charcuterie, I fielded great questions about how to pair food and wine. 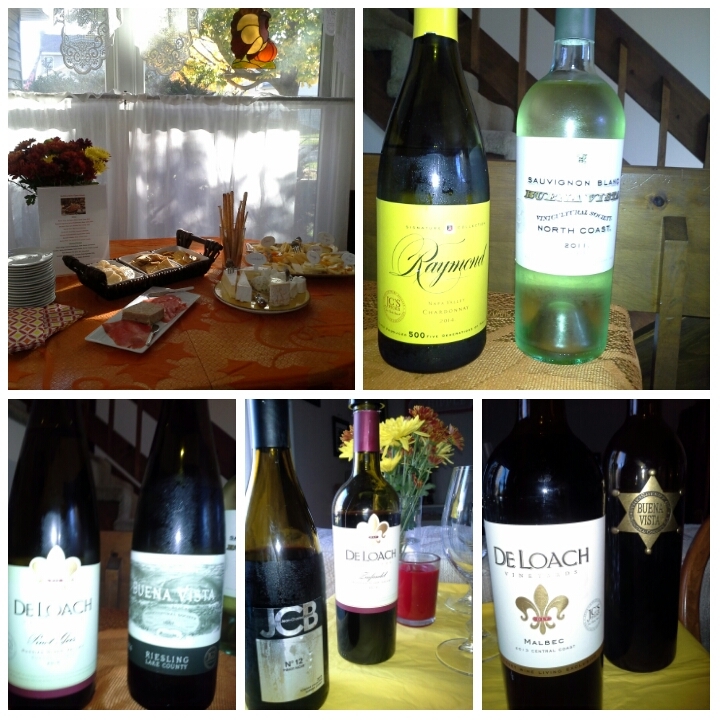 We engaged in lively conversation, laughter, and of course sipped delicious wines! My guests were able to select their favorites and have them shipped directly to their homes in time for both Thanksgiving and Christmas! Buena Vista Lake County Riesling, JCB No 12 Pinot Noir, DeLoach Malbec, and Buena Vista The Sheriff were the favorites! If you are in need of the same service, please contact me and we will take “get wines for the holidays” off your checklist! This entry was posted in #Wine, Cheese and Wine, Wine Pairings and tagged #Buena Vista, #DeLoach, #Holiday wine-food pairings, #JCB. Bookmark the permalink.